What a great time last night in Albuquerque, at the Kiva Auditorium. 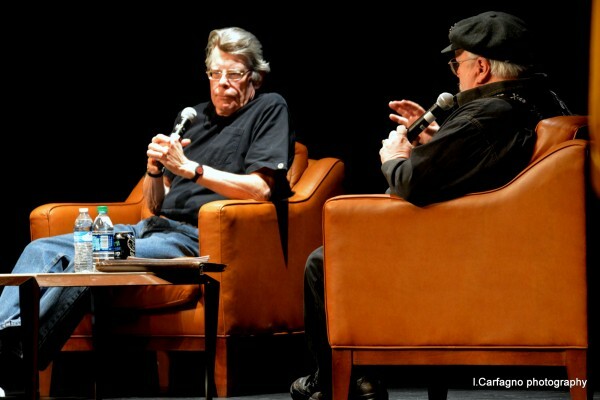 Stephen King is on tour to promote his new novel, END OF WATCH, the third and concluding volumes in his 'Mercedes killer' trilogy, and the good folks at Bookworks were kind enough to ask me to sit down with him for an hour of conversation. We talked about childhood, writing, reading, naked day, the nature of evil, and rats. Went for an hour, but we could have gone for ten. Steve's an amazing guy, and a great writer. (We hope to be able to offer a video soon. Watch this space). I would love a video. Two great writers conversing? Doesn't get much better! Thanks for everything you both did for your readers. Two of the best, wish I could have been there! This would have been a great experience to sit in on! Two of my favorite writers in such an intimate setting. I'll be keeping an eye out for a potential video. I attended a couple of events where Stephen King was presenting a book or giving a speech so it's not like I'm desperate to attend other events. But last night's one was possible the one I wanted the most to attend and couldn't (I live in Argentina so it's not cheap or around the corner). I dreamt about situations of the event all night long! I woke up and wanted to read everything about it. Two of my favorite writers in the same room! 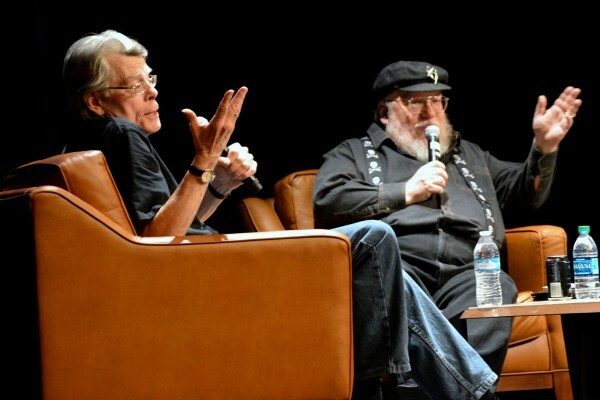 Out of curiosity, has Stephen King read the Song of Ice and Fire Books? I can't wait for the video! Two of my favorite authors together. .... I LOVE this! My two favorite writers (I know, such diifferent styles, but that's the great thing about it :) ) sat together and talked. I really hope to find a video. :) Totally made my day. Good night (in Germany it is 10pm now and my 4 kids love to get up at like 5.30 am....)! The two of you are both experts on exacting pain on your readers (in a good way). Please don't share too many ideas. Also what is naked day? Oh wow I can't wait for the video! I love your talks George. Are you considering doing another talk with Gardner and Howard, not per se aSoIaF related, like you did at Capclave 2013? If anything needed to be a 10-hour podcast series, this is it! I'm so bummed I didn't catch a video feed of this, your meeting with Joe Hill was amazing. Naked Day had me laughing so hard when you asked him if you could ask SK about it- I'd have loved to see his reaction! Good stuff! I drove in from Dallas to share that evening with you lovely gentlemen. The discourse was beautifully balanced, the camaraderie on stage and in audience was palpably pleasant, and it was overall magic. Thanks to both of you for sharing your creativity with the planet, and for serving delight and inspiration to current readers and future writers, as others have done for you. Can't wait to see the video! You and Stephen King are my two favorite authors, and I think it's great that you were able to get together. Would you consider writing a non-fiction book in the similar vein of On Writing?